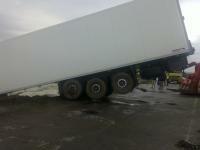 Heavy truck hit other tyr. 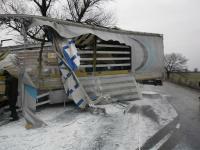 Beka Road Assistance-trailer truck crashed into a bridge. 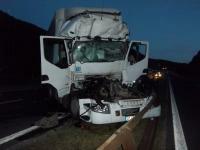 Truck carrying clothes hit the column of the Trakia motorway bridge. 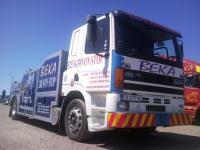 Beka Road Assistance - has a large security parking. 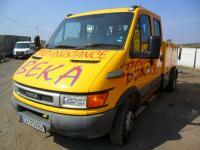 Beka-Road Assistance has a large security parking. 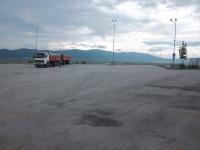 Parking is located on the 43rd km of highway Trakia, the territory of Motel Ihtiman. Parking is on two levels with a security guard and CCTV. 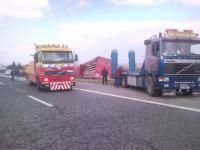 Beka Road Assistance - Truck-trailer fell from a bridge. 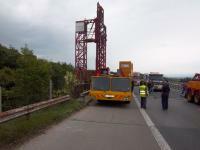 Truck-trailer hit the middle of the Containment between two bridge of the Hemus motorway, , Tore the railings and fell from the high 78 meters viaduct. 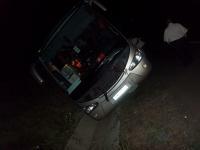 Beka-Road Assistance- Omnibus stopped in a mound of earth. 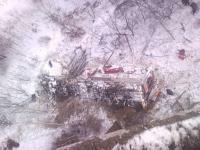 Omnibus full with 50 Romanian tourists crashed into a mound of earth after crash. 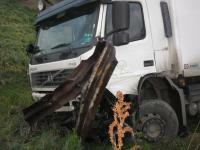 Beka Road assistance - Truck off the road near Lake Iskar. 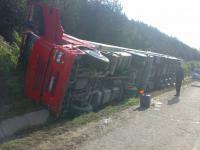 Truck carrying livestock plunged 60 meters from the road without tipping over. 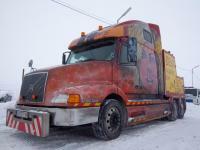 Beka Road Assistance - Truck stuck insnowdrifts. 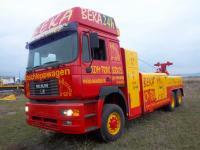 Beka Road Assistance - Truck stuck insnowdrifts. 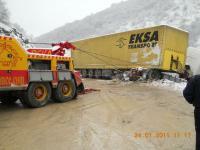 Truck with trailer loses control because of icy road near Targovishte. БЕКА Пътна Помощ- Камион с ремарке се озова в снежните преспи извън пътя. БЕКА Пътна Помощ – Извади автомобил от язовир. Високо проходимият автомобил след като изпуснал пътя се озова почти изцяло потънал в язовира намиращ се в близост на шосето по което се е движил. 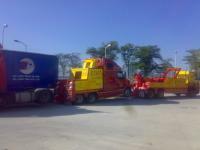 Beka tow present you the new vision of impressive VOLVO VNL660. Инцидентът е станал на около 25 километра преди София. Турският ТИР превозващ електроника за “Тойота“ удря спрял в аварийното платно български камион, който превозва перилни препарати. БЕКА пътна помощ се справи с тежка катастрофа на камион с ремарке който се преобърна на АМ Тракия и изсипа товара си. БЕКА ПЪТНА ПОМОЩ- Купи нов специализиран камион за обслужване на рейсове и камиони. Камион натоварен с 20 тона лук се удари в средната мантинела на моста на 38-ми километър на АМ „Тракия” на 20.05.2011 след полунощ. 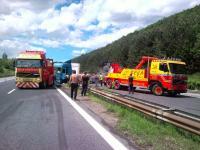 BEKA roadside assistance - Greek tractor with semitrailer - tank carrying glucose, capsized near Pleven on 09.07.2009. 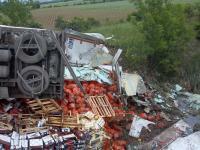 Refrigerator truck loaded with vegetables, turned around and lies down in the gutter of the Trakia motorway. 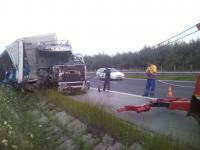 BEKA roadside assistance - truck-trailer lost control on the road and fell into the bed of small river which passes under the highway on 28 th kilometer before Sofia. 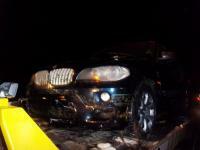 BEKA roadside assistance - Turkish TIR smashed two cars of the 8th kilometer of Trakia highway towards Sofia 16.04.2011g. at night. BEKA roadside assistance - 20.05.2008g. 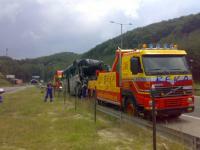 DAF composition - gondola loaded with coal turned the road Vakarel - Novi Han. 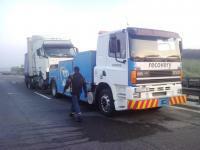 BEKA ROAD ASSISTANCE- truck fell into theriverbed.